KoopaTV: Welcome to Smash 4, Mac Baby! By LUDWIG VON KOOPA - No doubt thanks to KoopaTV's effective lobbying efforts. Back in August 2013, KoopaTV dedicated a week to Punch-Out!!. We even changed the site's banner and everything. For Punch-Out!! week, I advocated for Little Mac to be a newcomer to Super Smash Bros. 4 as the first on my list. Then later on in the week, we released Trayvon Tyson's Punch-Out! !, which is a SMASH hit, winning PC Game of the Year. That raised Little Mac's public profile considerably. "Become a Super Smash Brother!" And so, he did. And so, we're very pleased that Masahiro Sakurai took our advocacy to heart and inserted Little Mac as a playable character into Super Smash Bros. 4. That character trailer is simply amazing. The music is spectacular, and I've probably listened to it over 100 times already. I've even listened to the Japanese version, which, as I said on Miiverse... is rather scary. Dangit, Doc. I like how they dubbed the chocolate-eating sound effects at the end, though. 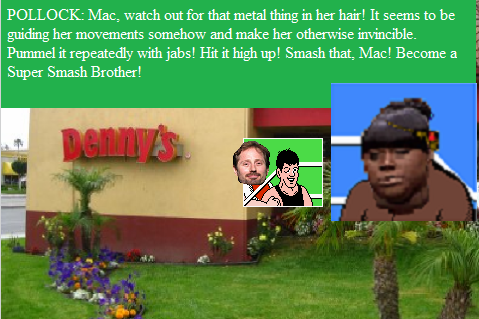 People thought Mac couldn't do anything besides punch, so he couldn't get in. Well, guess they're wrong. We'll keep them feeling bad at KoopaTV. Ludwig hopes you didn't doubt Mac, because then you would have to feel bad as well. Another boxer enters the ring for the first time...!